Synopsis: In LET'S PRETEND THIS NEVER HAPPENED, Jenny Lawson baffled readers with stories about growing up the daughter of a taxidermist. In her new book, FURIOUSLY HAPPY, Jenny explores her lifelong battle with mental illness. A hysterical, ridiculous book about crippling depression and anxiety? That sounds like a terrible idea. And terrible ideas are what Jenny does best. 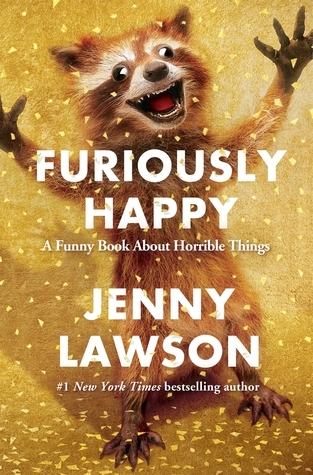 According to Jenny: "Some people might think that being 'furiously happy' is just an excuse to be stupid and irresponsible and invite a herd of kangaroos over to your house without telling your husband first because you suspect he would say no since he's never particularly liked kangaroos. And that would be ridiculous because no one would invite a herd of kangaroos into their house. Two is the limit. I speak from personal experience. My husband says that none is the new limit. I say he should have been clearer about that before I rented all those kangaroos." "Most of my favorite people are dangerously fucked-up but you'd never guess because we've learned to bare it so honestly that it becomes the new normal. Like John Hughes wrote in The Breakfast Club, 'We're all pretty bizarre. Some of us are just better at hiding it.' Except go back and cross out the word 'hiding.'" Jenny's first book, LET'S PRETEND THIS NEVER HAPPENED, was ostensibly about family, but deep down it was about celebrating your own weirdness. FURIOUSLY HAPPY is a book about mental illness, but under the surface it's about embracing joy in fantastic and outrageous ways-and who doesn't need a bit more of that? Jenna, the booktuber from Jenna Clarek did a video talking about listening to the audiobook, and based off the audiobook, it seemed like I could really like it, so I decided to listen to the audiobook as well. It took me awhile to get through it because I only listened to it while I cooked, ate, or cleaned, but I eventually got through it. In the start, I really enjoyed it, but as it continued, I didn't like it as much. I really enjoyed the messages Jenny had to say, but sometimes I didn't like how she went off track a lot, but I suppose that is just the type of person she is. I've been exactly where she is with depression and anxiety. While my anxiety has improved vastly since high school, the depression hasn't in the least bit. I loved how she would describe the days when she just couldn't get out of bed or would hide under her desk because the world was too much for her. I've had those days more often than I'd like, but it was nice to read about someone who has felt the same thing I have felt. Overall I liked the book, but it wasn't anything phenomenal or great. I enjoyed it, but there were times when I got bored.